When the market thinks lightweight technology, it thinks value and efficiency, then mass reduction. After strong success with lightweighting in the automotive industry, we’re pushing our capabilities to all markets. Before jumping into our lightweight capabilities, let’s touch on the feats we’ve already seen with this technology. In automotive applications, our products have helped reduce overall mass up to 60 percent – often resulting in lower inertia and NVH - while matching the mechanical performance of steel. Did you miss our introduction into the Industrial Markets? Catch up here. What are Aluminum MMCs? 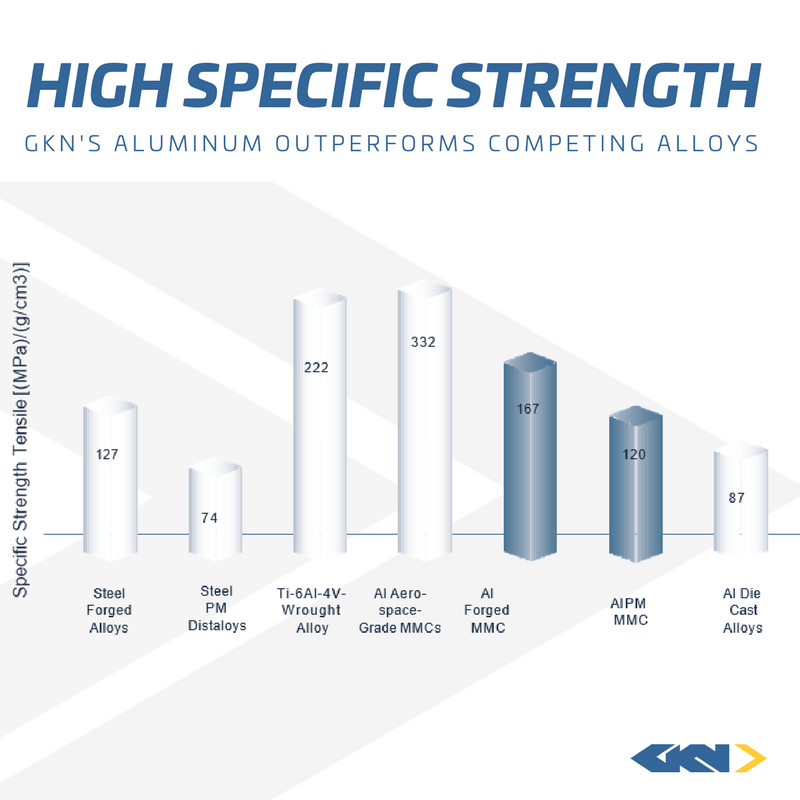 GKN’s Aluminum MMCs are designed with ceramic particles, equally dispersed within the aluminum alloy matrix, producing an aluminum alloy that improves static and dynamic performance. How has GKN specialized this technology? 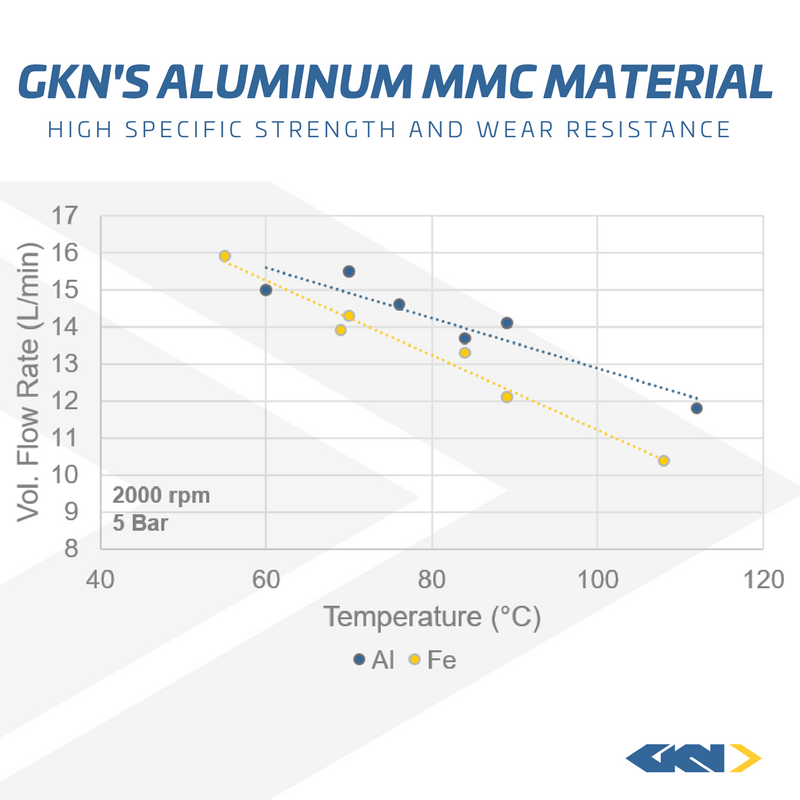 The thermal properties and wear resistance of GKN’s Aluminum MMC materials create unmatched efficiency savings. The material can perform for the strength needed in an application that die cast aluminum is unable to handle. A higher specific strength allows for mass reduction and improved efficiency. Let’s take a pump application as an example. Conventional, steel material rotating elements in aluminum housings have a lower coefficient of thermal expansion than the housing leading to pump inefficiencies as temperature increases. Standard Aluminum materials do not have the wear resistance to function as pump elements. The solution is GKN’s designed Aluminum MMCs that feature thermal properties and high strength and wear resistance that can increase efficiency by 20 percent – utilizing a smaller and more efficient system design. A traditional pump that consists of an aluminum housing expands to a greater degree as the pump heats up, creating a gap and allowing oil to leak. GKN's Aluminum MMC material is able to withstand the temperature and strength requirements to eliminate leaks. While the automotive has already seen a large advantage in a product’s mass and size reduction, all markets have opportunity for lightweight savings. Before we move on from MMCs, it’s important to understand its reduction benefits. Aluminum MMCs are of higher strength than die cast aluminum, creating the opportunity to convert steel-made products into weight-reduced applications from the lower density in aluminum. Our lightweight products typically see overall weight savings of up to 50 to 60 percent. Lightweight powder metal products for assemblies, hand tools and gears can create competitive advantages for lighter and more efficient portable applications. Mass reduction results in lower inertia and a greater NVH performance. Why does this matter? GKN’s MMC materials produce less noise and vibration, creating a quiet and high performing product. When we say thermal management, we mean our technology’s ability to keep a product at its regular temperature through aluminum applications with industry- leading thermal conductivity. GKN’s lightweight technology provides high thermal conductivity properties for power electronics, processor cooling and lighting applications. For these groups, a high thermal conductivity material has the potential improve overall efficiency. GKN's aluminum powder metal material outperforms conventional aluminum extrusions and castings by limiting solute impurities. Let’s use another example: heat sinks. GKN’s heat sinks for a car radio cooling application have exceptional thermal conductivity, which in turn requires the product to have less thermal mass. A reduction in thermal mass means a reduction in space and weight: a significant advantage for space-challenged applications. GKN’s heat sink material was developed to take advantage of our powder metal capabilities and offer thermal management advantages that die casting could not provide.